Be the first to share your favorite memory, photo or story of Dr. Kathleen. This memorial page is dedicated for family, friends and future generations to celebrate the life of their loved one. Dr. Kathleen Jean Trueb, daughter of John and Virginia Smith Brandes, September 25, 1947 in St. Louis, Missouri. 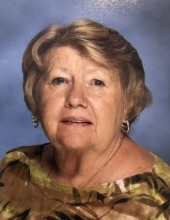 She departed this life, February 10, 2019, in her home, Linn Creek, Missouri at the age of Seventy one years, four months and sixteen days. She was preceded in death by her parents and one sister Anne Hawkins. She is survived by her husband, Donald Trueb of Linn Creek, Missouri,; four children, Sandra Young and husband Dave of Blue Springs, Missouri, Joe Trueb of O'Fallon, Missouri, Chris Trueb and wife Marcia of O'Fallon, Missouri, and Cheryl Trueb of Hazelwood, Missouri,; grandchildren, Alexandria and husband Tony, Evan, Courtney, Isabel, Sarah, Austin, Andy and Rachel,; one great grandchild, Calder,; and a host of nieces, nephews, other relatives and many friends. Kathleen was raised in the North St. Louis area and Cahokia, Illinois. They have always traveled to the lake. She graduated from Lindenwood University in December 2009 with her Doctorate in Education. Kathleen made a profession out of faith and teaching and was a member of Assumption Catholic Church in O'Fallon, Missouri. She also attended church at St. Anthony Catholic Church in Camdenton, Missouri. She was very active in the church. She taught PSR, helped at the church and would even take communion to people who couldn't attend church. In her spare time she enjoyed spending time with her grandkids, traveling and playing games at the Elk's Lodge. She was a loving wife, mother, grandmother, daughter, sister and a caring neighbor and friend. We celebrate her life and her accomplishments and will treasure the memories she created for her family and friends. To send flowers or a remembrance gift to the family of Dr. Kathleen Jean Trueb, please visit our Tribute Store. "Email Address" would like to share the life celebration of Dr. Kathleen Jean Trueb. Click on the "link" to go to share a favorite memory or leave a condolence message for the family.